Jessica Vaughan, director of policy studies at the Center for Immigration Studies, told Breitbart News that former Secretary of Homeland Security Kirstjen Nielsen actively undermined President Donald Trump’s agenda on border security and immigration, offering her remarks on Monday’s edition of SiriusXM’s Breitbart News Tonight with host Rebecca Mansour and special guest host Patrick Courrielche. 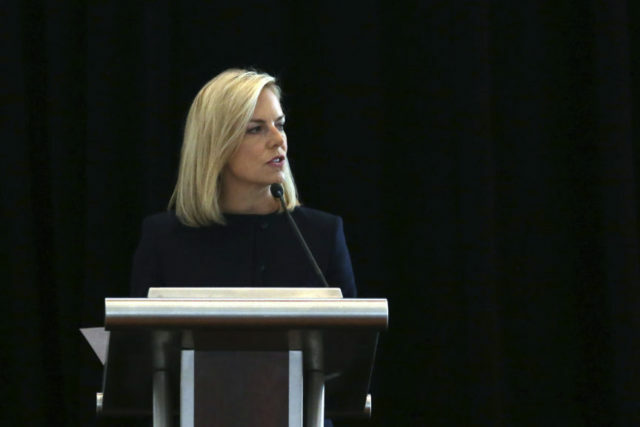 Mansour invited Vaughan’s comments on Nielsen’s conduct as the former head of the Department of Homeland Security (DHS) following Nielsen’s resignation on Sunday. Mansour asked Vaughan about Nielsen’s expansion of DHS’s “catch and release” policy. “[Kirstjen Nielsen’s] strategy seemed to be that if things got really bad, and she could just explain to the members of Congress and to the public that things were really horrible at the border — that it’s out of control, that it truly was a crisis — that Congress would act the change the laws to enable her to stop this crisis,” explained Vaughan. Nielsen secured her role at DHS via her professional and personal proximity to John Kelly, recalled Vaughan.